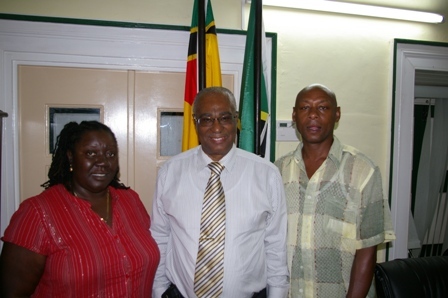 (CHARLESTOWN, NEVIS–March 28th 2011) Officials of the St. Kitts and Nevis Association of London and Leeds paid a courtesy call on the Premier of Nevis, Hon. Joseph Parry, at his Bath Hotel office on Friday morning. “I am pleased that I was able to answer questions, give advice and meet with Nevisians from the Diaspora,” said the Premier. Chairperson of the St. Kitts-Nevis (SKN) Association-London Chapter, Ms. Sandra Liburd and Vice Chair of the Leeds Chapter SKN Association, Mr. Claude (Hopper) Hendrickson said they spoke to Premier Parry on a number of issues including a strategy for returning nationals, utilizing the Nevis groups in Great Britain and setting up a Nevis Tourism office in the UK. “It was an honour for me to speak with Premier Parry as he took a few minutes out of his busy schedule to talk to us on a number of issues concerning the Nevisian communities in England,” said Ms. Liburd. According to Mr. Hendrickson, the organization is hoping to have greater links with Nevis in terms of Sports, Education and Culture. “We are hoping that the Premier and members of his Cabinet can visit the highly concentrated Nevisian communities in England in order to have dialogue, so that Nevisians resident in Britain could have greater awareness on what is going on at home (Nevis),” said Mr. Hendrickson.